Underwater photography is one of the most exciting—and challenging—ways to use your Nikon 1. The cameras' outstanding autofocus system and 1 NIKKOR lenses help you capture sharp views of fast-moving underwater subjects, but to really bring home the vibrancy and colors of your underwater adventures, you need an external flash. 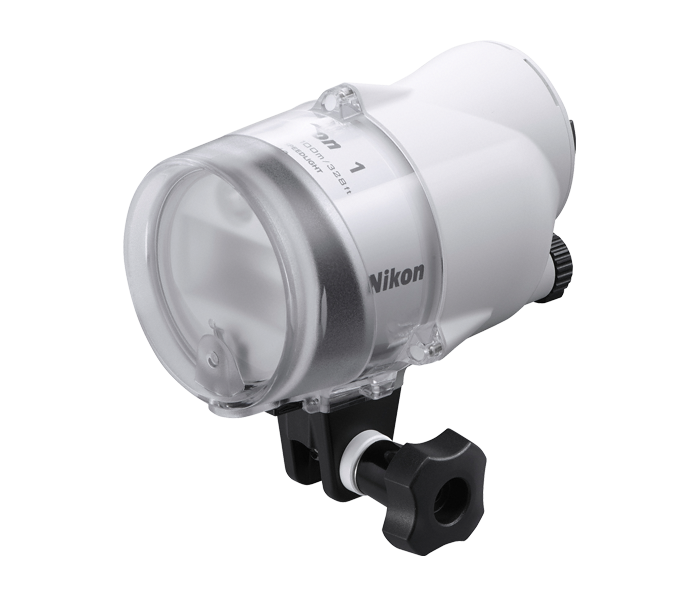 Introducing the SB-N10 Underwater Speedlight, a powerful underwater Speedlight flash for all underwater Nikon 1 possibilities. Waterproof down to 328 feet and with a guide number of 28/92 (m/ft, ISO 100), it can illuminate even the deepest waters. The SB-N10 Underwater Speedlight is waterproof all the way down to 328 feet—far below the reach of natural light—and powerful enough to illuminate subjects at those serious depths (guide number of approximately 28/92 [m/ft, ISO 100]). Whether you're snorkeling over a shallow reef or diving the depths of a canyon, capture beautiful, colorful underwater scenes that wouldn't be possible without a flash. The SB-N10 Underwater Speedlight works with every underwater Nikon 1 solution—J1 or J2 with the WP-N1 Waterproof Housing, J3 or S1 with WP-N2 Waterproof Housing, J4 or S2 with WP-N3 Waterproof Housing or the fully waterproof AW1. It easily mounts on the optional SK-N10A Underwater Bracket and SC-N10A Underwater Fiber-Optic Cable (add the SR-N10A Underwater Fiber-Optic Cable Adapter for use with the AW1), and it works with the AW1's pop-up flash for additional lighting power in deep water. Take control of the flash strength and fine tune it for your shot. Easily select the auto TTL mode for use with the AW1, WP-N3, WP-N2, or WP-N1 or use one of the two manual flash modes when using the SB-N10 Underwater Speedlight with the Nikon 1 AW1 or WP-N3. The Targeting Lamp shows where the flash will be directed and helps your Nikon 1 autofocus on subjects in shadow before the flash fires. Add the Wide-Flash adapter to increase illumination coverage to 120°.